← Poetry that frees the soul. This post is written by Ana Swanson and published in The Washington Post February 9th, 2015. Shared with gratitude to Ketan Shah. Kurt Vonnegut claimed that his prettiest contribution to culture wasn’t a popular novel like “Cat’s Cradle” or “Slaughterhouse-Five,” but a largely forgotten master’s thesis he wrote while studying anthropology at the University of Chicago. The thesis argued that a main character has ups and downs that can be graphed to reveal the taxonomy of a story, as well as something about the culture it comes from. “The fundamental idea is that stories have shapes which can be drawn on graph paper, and that the shape of a given society’s stories is at least as interesting as the shape of its pots or spearheads,” Vonnegut said. In addition to churning out novels, Vonnegut was deeply interested in the practice of writing. The tips he wrote for other writers – including “How to write with style” and “Eight rules for writing fiction” — are concise, funny, and still very useful. The thesis shows that Vonnegut’s preoccupation with the nuts and bolts of writing started early in his career. 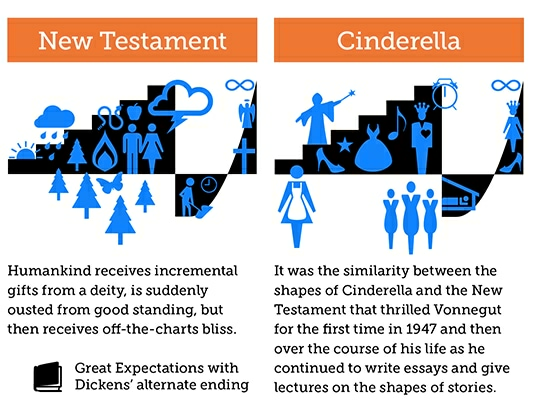 Vonnegut spelled out the main argument of his thesis in a hilarious lecture, where he also graphed some of the more common story types. (Vonnegut was famously funny and irreverent, and you can hear the audience losing it throughout.) He published the transcript of this talk in his memoir, “A Man Without a Country,” which includes his own drawings of the graphs. 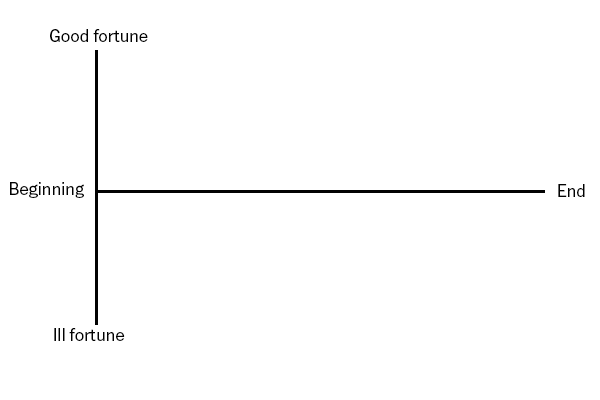 Vonnegut plotted stories on a vertical “G-I axis,” representing the good or ill fortunes of the main character, and a horizontal “B-E” axis that represented the course of the story from beginning to end. 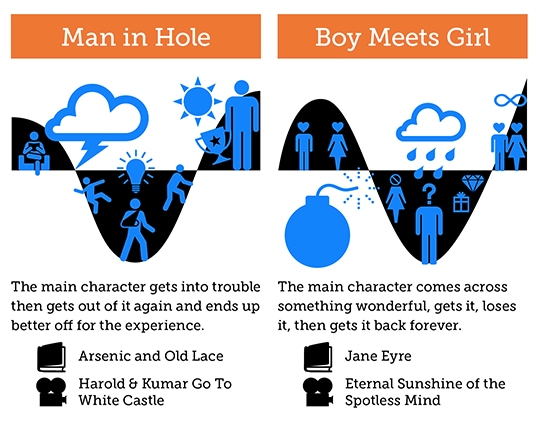 One of the most popular story types is what Vonnegut called “Man in Hole,” graphed here by designer Maya Eilam. Somebody gets in trouble, gets out of it again, and ends up better off than where they started. “You see this story again and again. People love it, and it is not copyrighted,” Vonnegut says in his lecture. A close variant is “Boy Loses Girl,” in which a person gets something amazing, loses it, and then gets it back again. Creation and religious stories follow a different arc, one that feels unfamiliar to modern readers. 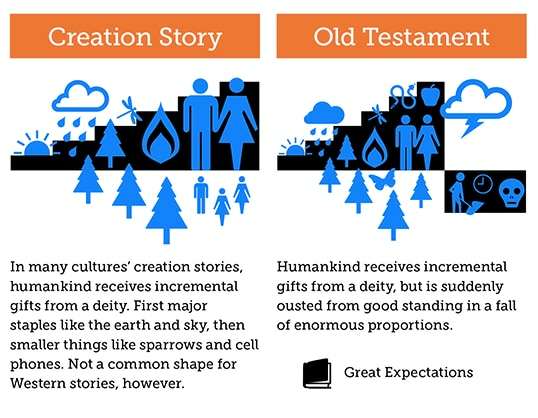 In most creation stories, a deity delivers incremental gifts that build to form the world. The Old Testament features the same pattern, except it ends with humans getting the rug pulled out from under them. 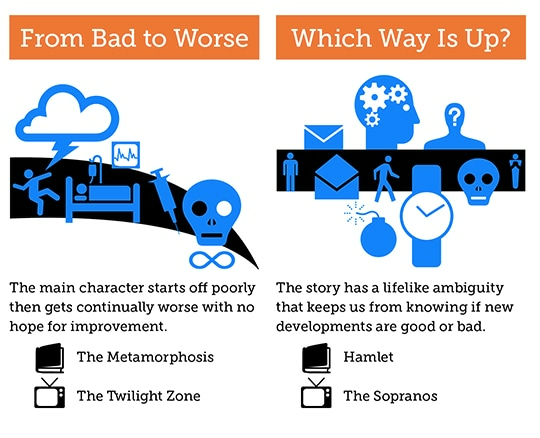 Some of the most notable works of literature are more ambiguous – like Kafka’s “The Metamorphosis,” which starts off bad and gets infinitely worse, and “Hamlet,” in which story developments are deeply ambiguous. “Cinderella or Kafka’s cockroach? I don’t think Shakespeare believed in a heaven or hell any more than I do. And so we don’t know whether it’s good news or bad news. “I have just demonstrated to you that Shakespeare was as poor a storyteller as any Arapaho. “But there’s a reason we recognize Hamlet as a masterpiece: it’s that Shakespeare told us the truth, and people so rarely tell us the truth in this rise and fall here [indicates blackboard]. The truth is, we know so little about life, we don’t really know what the good news is and what the bad news is.